At EBC its all about relationships. It’s focused on connecting with our church, building relationships with others, and ministering to one another in love and grace. One of the incredible facets about the Christian life is that it is centered on building relationships, first with our Lord Jesus Christ, then with others. God’s plan for His church is clear about being involved in the lives of others. How is that done? By building relationships. We believe that a Belong group is a great way to build meaningful relationships with others through genuine fellowship. The bi-weekly meetings have times for fellowship, prayer, and Bible sharing. They are small, casual, and caring. 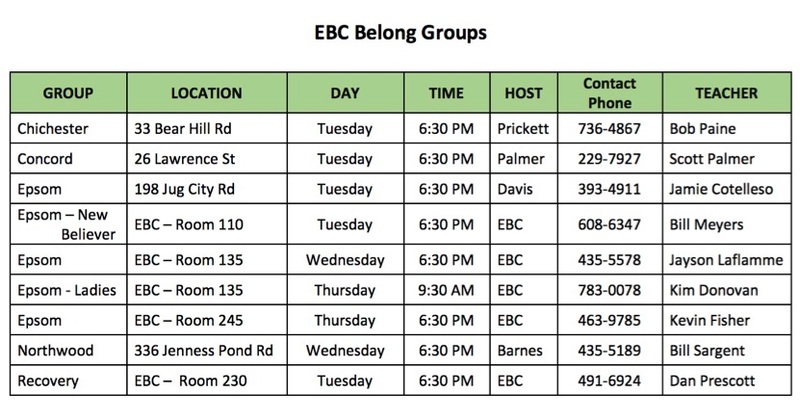 Join a Belong group and experience the family life of EBC. Click HERE to find a group near you.